September’s LoveLula Beauty Box is worth £50 and as always, it’s an amazing value for money. The highlight for me is definitely a gift set containing five Walden natural perfumes (5ml each) worth £30. The monthly subscription is only £13.95 so this makes it so worthwhile. The second product which I’ve been really happy to receive is an organic beauty balm from Balm Balm which is a full-size product worth £16.50 on its own. 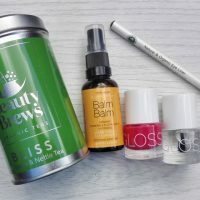 If you are not a LoveLula Beauty Box subscriber I highly recommend it – it’s a great way of discovering new natural beauty products and green beauty brands. It’s especially good for those new to green beauty. In the box you will also find a discount code for 20% off on all the brands featured in the box. You can subscribe here (there is a free delivery and you can cancel anytime). Disclaimer: I receive LoveLula Beauty Box every month as part of LoveLula Accredited Blogger Programme. Expect only honest and unbiased reviews of the products I receive. In this post you will find some affiliate links – if you click on them and purchase a product I get a small commission which helps me maintain this website. This does not cost you anything. There’s been lots of discussions about Walden Natural Perfumes in the green beauty community. Some people love them, some people hate them but what do I really think? 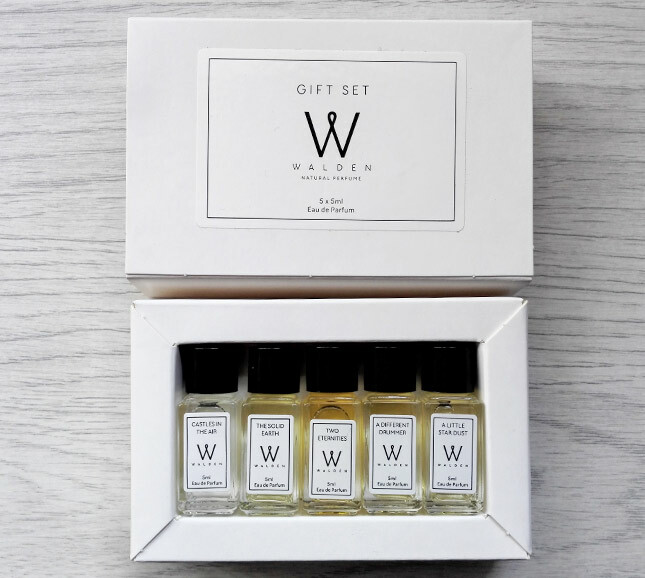 I think the gift set is fab – like this I can try all five Walden Natural Perfumes without committing to a full size product. I am actually really happy to finally have some natural perfumes at home. I haven’t used perfumes in years but always wanted to try some natural ones. Out of five perfumes, my favourites are A Little Star Dust and Castles in the Air. I prefer Castles in the Air a little bit more since it’s slightly citrusy with an addition of tropical flowers. I found these two favourites the most feminine while the others are more masculine in my opinion (great for men). I cannot decide on Two Eternities though, I think I could easily use it myself but my partner could also use it. I’ve actually tested a few perfumes on my fiance and I think A Little Drummer really suits him but also The Solid Earth is great for him. Walden Natural Perfumes are made from only the finest natural absolutes, resins and essential oils. For the description of each of the scents check this page. As these perfumes are so natural, the scent will not linger on you for the whole day – you will have to re-apply regularly. I don’t mind this though because they are so natural. I’d rather do that then use the synthetic perfumes. If you would like to try these perfumes but don’t want to buy the whole gift set, you can also buy individual samples on this page. Beauty balms are great multi-purpose products; they are quite concentrated and nourishing and great for winter. Balm Balm’s Beauty Balm can be used as a cleanser, exfoliator and moisturiser. It’s certified organic and suitable for all skin types. I’ve been using it on dry areas although I must admit I don’t have many just yet, have to wait for winter! The balm melts into the skin, leaving an oily layer which slowly absorbs and moisturises the skin. It soothes and calms the skin with its healing herbal extracts and anti-oxidants. You can use it as a lip balm and even as a balancing face mask. Esse Gel Cleanser smells like a toothpaste (contains peppermint and spearmint oils) and foams only slightly to cleanse the skin without leaving it dry. After use my skin feels nice and soft with no tightness. The minty scent is quite refreshing but at the same time peppermint also improves micro-circulation to aid in the elimination of toxins. This gel cleanser would be great for those who don’t like oil-based cleansers and are looking for an alternative cleanser which doesn’t dry the skin out. I’ve only tried the Tangerine & Calendula night cream so far and although the sample looks small it was enough for 4 applications. It’s a light cream but quite nourishing and gently hydrating. It’s ideal after summer as it is supposed to lighten dark spots and sun damage. It’s also great for healing acne. It didn’t give me any breakouts and in the morning I woke up to a nice and soft skin. I am not really a bath person so I won’t be really using this Bath Truffle from JOIK but from what I heard it smells amazing and great for dry skin (rich in cocoa butter). I think a pack of bath truffles like this would make a great gift for Christmas stockings. If you are a green beauty fan and want to subscribe to LoveLula beauty box click here. It’s only £13.95 a month, including the postage. You can cancel your subscription anytime. And remember, every month you will get 20% off on all the brands found in the box. What do you think of September’s LoveLula beauty box? Have you tried any of these products?